Binya House har den bästa utsikten över alla hus längs stranden i Drake Bay. Denna bekväma semester har två sovrum med luftkonditionering, och ligger bara några steg från 10 restauranger och 4 marknader. Nya apparater och möbler gör denna plats till ett äkta reträtt. Scarlet Macaws, Iguanas, Anteaters och en mängd färgglada fåglar besöker egendomen varje dag. Vandra in i Corcovado, en av de mest biodiversa platserna på planeten, eller lounge på många stränder längs kustleden. Huset är privat, men ändå mitt i centrum för din bekvämlighet och komfort. Turer och fiske kan bokas via Debra när du gör din bokning och du kommer att ha din egen privata concierge, Erick kommer att vara tillgänglig för dig som vill ha hjälp. Köket är fullt utrustat med mikrovågsugn, utbud, kaffepanna, kylskåp, kastruller och kokkärl så att du kan laga mat om du väljer. Vi har också gratis kabel-TV, och tvättmaskin och torktumlare. Det finns många aktiviteter som sportfiske, dykning, kajakpaddling, zip-linjer, djurlivsturer, pelagiska turer, val och delfiner, spjutfiske, vandringsturer, strandvandringar, ridning, förmåga att interagera med lokalbefolkningen i butiker, barer och restauranger . Världsklass dykning och snorkling på Cano Island är också här. 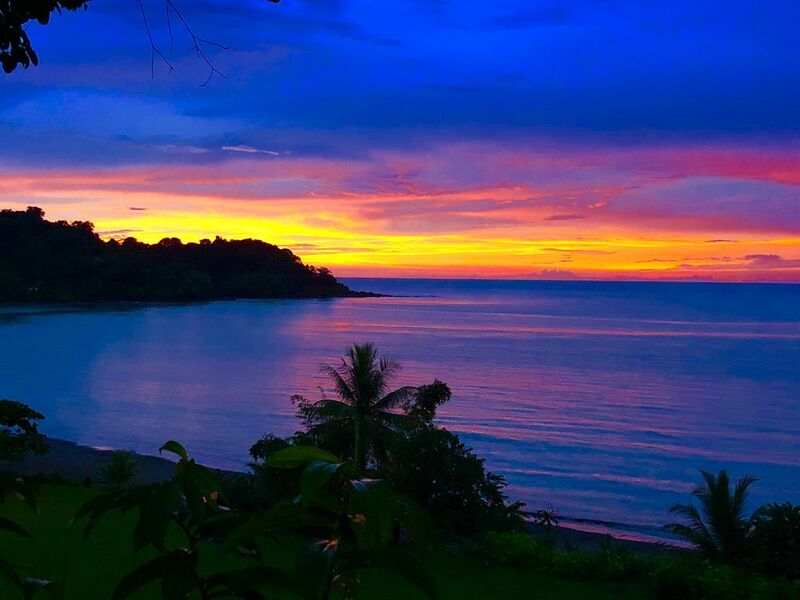 Drake Bay är besökta från människor över hela världen, men behåller sin autentiska Costa Rica-kultur. Det här är riktigt Costa Rica som du föreställde dig. I’m happy to say I picked the best place to stay in Drake Bay! The house is very comfortable, centrally located, and has a view to die for. Eric checked on us daily and helped us with whatever we needed. He took us diving and set up a zip lining tour for us. We enjoyed his company and friendship while there. We would definitely come again! It was a pleasure host you. Glad you enjoyed diving and hanging out with Eric on his dive boat. Please come again and stay with us! Binya House was perfect for our week at Bahia Drake! The house is perfectly located on a bluff overlooking the beach, which was a five minute walk down the road. The view was incredible, the house was comfortable, clean, with everything we needed to prepare our own meals. The air conditioning was a plus, and both Hank and Eric (next door neighbor and caretaker) were super helpful. There’s a trail at the end of the beach in which one can hike for hours to beautiful, secluded coves which was the highlight of our trip, and we loved coming back to the house at the end of the day for a relaxing early evening on the patio. The laid back vibe and remoteness of Drake made it the perfect location for us. We were sad to leave but will definitely return! Binya House was absolutely perfect for our family of five (2 adults, 3 children ages 7-10). The views are outstanding and Drake Bay is an amazing destination. Debra and Erick were fabulous in helping coordinate things - Erick stopped by daily to help us arrange tours and had excellent recommendations - we did the floating tour (everyone's favorite! ), Corcovado, and the canopy tour. We saw macaws and monkeys on a short hike near the house and watched two iguanas play every day in the tree behind the house. We were so sad to leave and return to reality! This family was a pleasure to host. Really friendly and excited about Drake. It makes it fun to hear about their experience of our amazing place in the jungle. Thanks again for coming and please come back. Binya House was located within the town so was convenient to restaurants, groceries, beach, etc. It had an incredible view of the beach. You could watch the waves and boats in the bay. House had all we needed. A/C was a big plus. Debra and Erik were fantastic in arranging tours and coordinating logistics. If you are interested in being in the rain forest but want to stay in a home instead of hotel, this is the place to be. We really enjoyed hostng Craig he was an incredible guest who enjoyed the rainforest and our home. He took good care of the place and really stood out as a friendly man with great conversational skills. we welcome him bak any time. AMAZING views of Drake Bay from Binya House! The house has everything you need and is just a short walk from grocery stores, restaurants, and the beach. We loved seeing all the birds and iguanas in the surrounding trees. Scarlett macaws flew across the ocean almost every day. Jungle trails to isolated beaches right nearby. Alex was also very kind and helpful. We treasured our time here and highly recommend it! These were really great guests who seemed to enjoy themselves at Binya House. They will be welcome back.